I-AM are genius brand consultants and designers, they have guided us, steered us and given us a huge amount of creative intelligence. Over the course of a ten-year relationship with Domus, I-AM have reviewed and developed their brand and sales process and created two inspirational showrooms in Clerkenwell and London’s West End. Domus has provided a unique environment for clients to explore new ideas. The design concept for the Clerkenwell showroom is ‘back to front’ and was inspired by visiting the Domus warehouse and their many suppliers in Northern Italy. The showroom has been returned to its foundations, stripped of artificial display walls and counters to reveal the body of this generous space. I-AM’s concept for the West End showroom develops the idea that ‘opposites attract’. By opening the space and using dynamic, innovative materials, the showroom is a versatile event and meeting space and a practical working environment for the Domus team. Both showroom designs have delivered considerable commercial success, with Eastcastle winning ‘Best Retail Interiors’ at the Design Week Awards in 2014 and being awarded a commendation at the Drum Design Awards 2014. 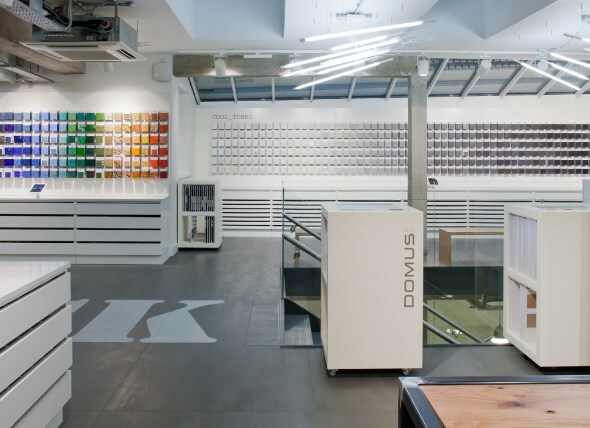 Clerkenwell won ‘Store Design of the Year’ at the 2012 Retail Week Awards.